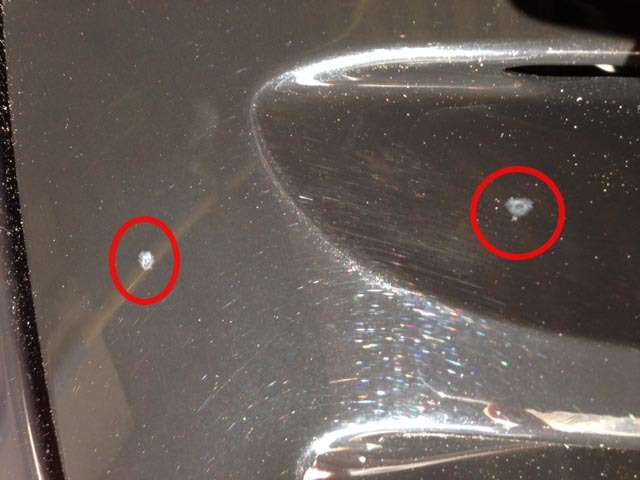 These white spots on my deck lid may have probably been there for awhile, but I recently noticed them. There is a very slight ridge around them. Is that etching? If so, will Dr. Colorchip or similar product help? A bit big for Dr Colorchip but maybe doable if you have patience to do it multiple times. Dr Colorchip works really well for small chips, you have to reapply several times to get the bigger ones. You have to wait days between applications though. It's hard to tell from the photo, but these don't look like normal paint chips. The one time I tried to repair such a non-trivial spot on another car it went awry. I made it worse and ended up having to get professional repair. Be careful, especially since it appears to be metal flake which is even harder to get right. My local Porsche dealer has a guy they refer to as their paint "magician" that does touch-ups on their CPOs and other used cars prior to resale. I assume that most dealers know someone like this that they trust and can refer you to. In my case, I got his name from them and had him fix my above-mentioned mistake. It only cost me $100 and while not utter perfection (which would have required a $1000 major panel repaint after I screwed it up), no one ever noticed the spot other than me. You had to know exactly where to look and even then the lighting had to be just right. Bottom line: Let a pro touch-up guy do these. I have had dry pine sap look like that. Dry and dusty, looked like a hole. When in fact it was on the paint. Some lighter fluid on a piece of paper towel, let it soak for 30 min. Wiped right up. Tuff to tell from your photo. I am more bothered by the swirl marks =) car wash? Any harm to leave A/C on before I shut-down or start-up engine? Quick Reply: Out Damn Spot!